Becoming a sustainable organization, especially at the DIY level, is something constantly in balance at Front/Space. Over the last two and a half years, we have experienced unprecedented growth which has challenged the way Kendell and I look at finances in our small volunteer run organization. It may seem hard to believe, but our operating budget for the year is close to $18,000. With rent as our largest expense, we constantly come back to our core question: How can we serve artists and pay them for their creative labor? 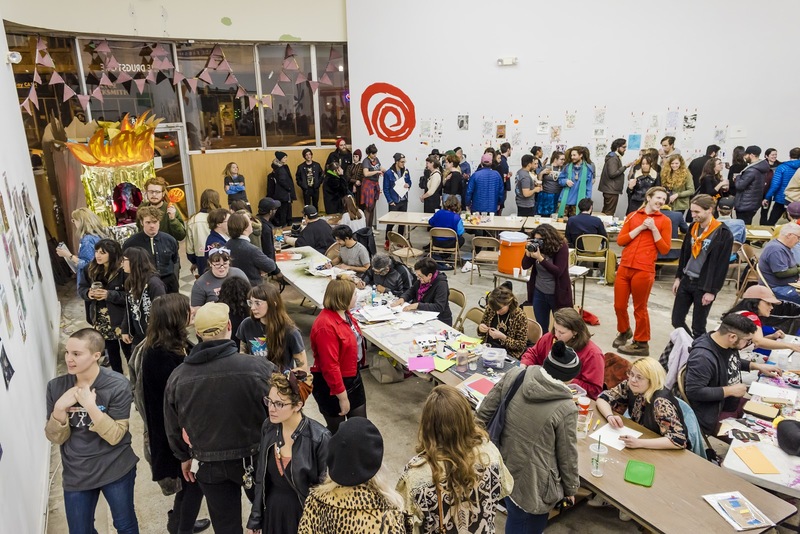 The crowd at Hot Hands 2017 hosted at The Drugstore Studios in Kansas City, MO. We strive to provide support by the means of stipends to in-town and out-of-town artists, as well as paying a photographer to document our exhibitions. 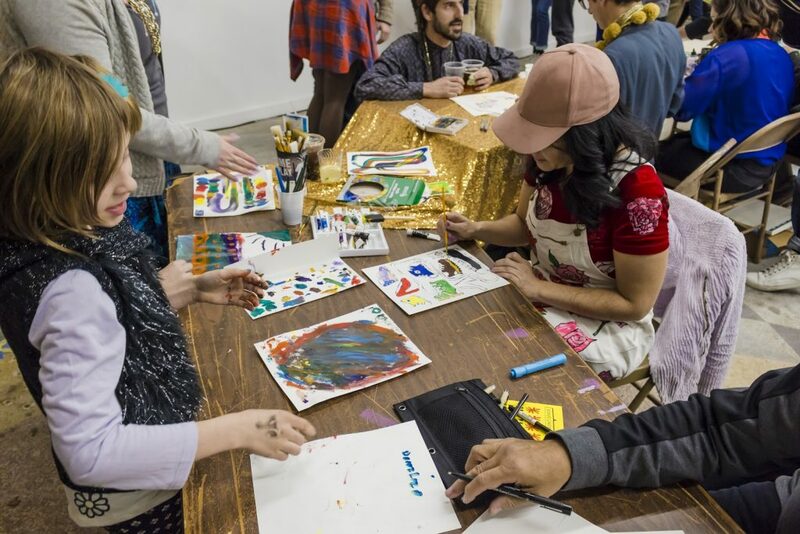 With these expenses being the foundation of our budget, we realized that we would need a variety of funding sources to close the gap between our grant from the Robert Rauschenberg Foundation and operating expenses. 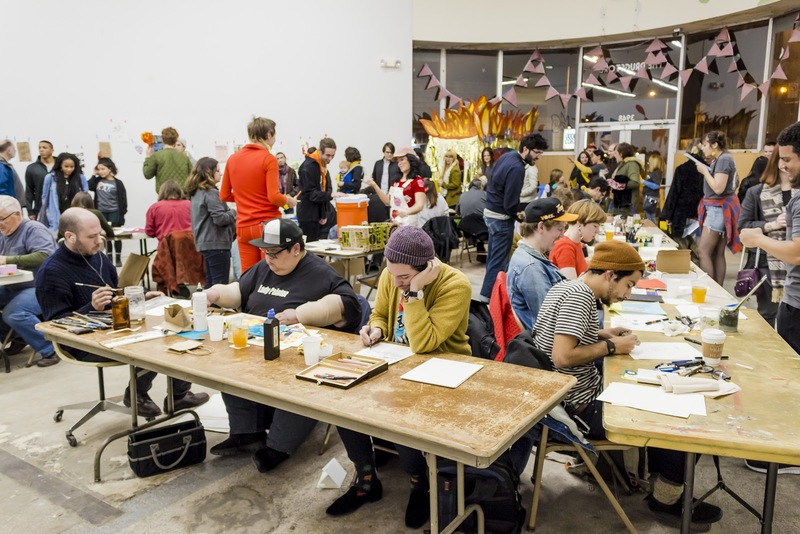 With multiple consultations with a variety of community partners, we decided to look into fundraising models created by similar sized DIY organizations. 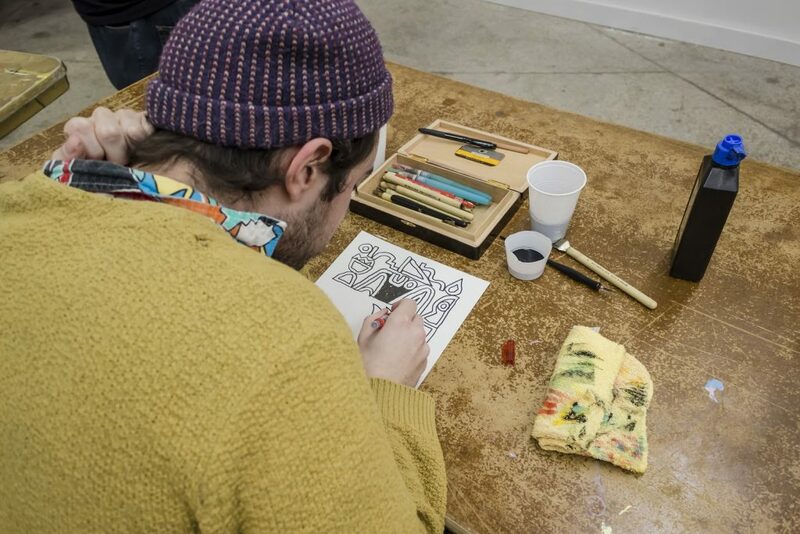 Artist Spencer Pullen drawing at Hot Hands 2017. We landed on the idea for Hot Hands, a live drawing and fundraising event, because we saw it as an opportunity to showcase a distilled version of our goals as a whole for Front/Space. Hot Hands is centered around a very simple format of promoting artists. One night only, artists make their work on the spot that can be purchased for a flat rate of $30. Each artists tackles this challenge in a different way, forging new ways of thinking in their personal studio practice. We quickly realized how democratic the event can be for both those who are participating or attending. The $30 price point makes the art work extremely accessible, “leveling the playing field” between emerging and established artists. Whether you are a first time collector or a savvy buyer, anyone can witness the magic of an artwork’s creation from the artists’ hands to the finished piece on the wall. 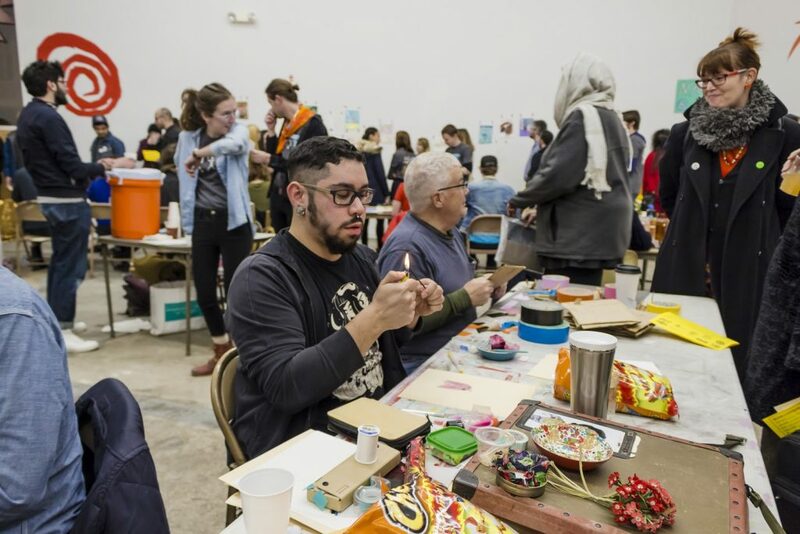 Artists Rodolfo Marron III and Garry Noland making their work during Hot Hands 2017. Establish your venue. This will assist in knowing the capacity for your event. Form a budget that seems reasonable to fit within that venue. For instance, if your goal is to raise $10,000 but your space’s capacity is 150 people, perhaps you need to partner with another larger organization with enough space to host your event. Establish your artist roster. Who will be participating? Be sure it is a mix of well known artists in the community as well as emerging artists who are looking for opportunities. Outline the event to the artists and make sure they are a good fit. Many might be nervous about crowds or making work on the spot. Establish a Volunteer Coordinator and gather volunteers. Communicate your expectations to the Volunteer Coordinator and make sure they understand the multiple roles that need to be filled such as the register, greeting guests, runners, art handlers, set up and break down, etc. Do not forget to make your volunteers feel appreciated! Solicit Donations. Ask ask ask! You never know if someone will donate until you ask. Soliciting alcohol donations to be then distributed (not sold) is helpful and tips can be a large source of income for the event. Communicate with your artists and establish a meet and greet so they can get to know each other. It is also helpful to have your volunteers meet the artists before hand so they can accurately promote and advocate the artist’s work and help answer any questions to guests. Establish a system for taking money. Since Front/Space has a parent organization as our fiscal sponsor (Fractured Atlas) we had to conform to a couple of rules set in place by them. Determine if you will take sales with cash and/or card. Merch! A commemorative t-shirt or tote bag (if marketed correctly) can go a long way but also do not forget to do a non-specific-to-the-event merch item as well. That way if you do not sell out of the t-shirts that say “Hot Hands 2017” you can use them for other fundraising opportunities or sell them throughout the year. Understand your audience. Figuring out who you are targeting to attend your event. Most people who are excited to spend $30 on a piece of artwork (a steal!) will not pay a $20 admission cover. Understanding who you are throwing this event for will contribute to its success. Follow up! Thank you cards, emails, whatever it takes. Be sure to follow up with your audience, volunteers and artists after the event to be sure everyone knows that without their support this event (and your organization!) is not possible. Artist Peggy Noland during Hot Hands 2017. All photos by Timothy Amundson.